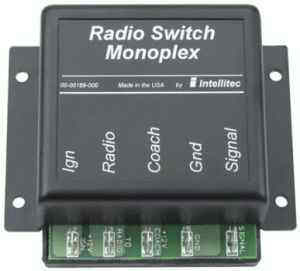 In a typical installation a MONOPLEX Controller is located near the load to be connected, with the control wire routed to the remote switch or switches, which are located in convenient places throughout the vehicle. By using this scheme, the need to run the heavy gauge wire to each switch is eliminated, along with difficulties of connections and safety problems normally associated with conventional techniques. Each component of the MONOPLEX System has been designed to work together, in the RV/Marine environment, to provide a high quality, simple, and trouble free product.